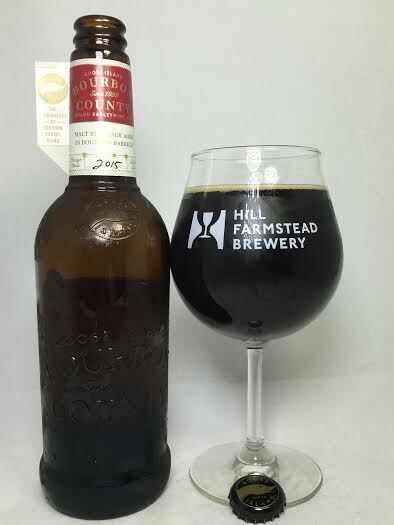 Number two in my Bourbon County reviews brings us to Bourbon County Barleywine. Originally introduced to the mass markets in 2013, this English Barleywine is aged in third-use bourbon barrels that previously contained Bourbon County Brand Stout. Also, I believe the recipe is the same as Goose Island's legendary King Henry, but KH was aged in the famous 23-yr-old Pappy Van Winkle barrels that people who have never been interested in bourbon will tell you is the best bourbon ever made. Surprisingly, this variant of the Bourbon County beers was the most scarce during my Black Friday hunt last week. The beer looks black, but is actually the darkest shade of mahogany/ruby red. The pour generated less than a finger of tan head. The aroma has sweet, rich malts, bourbon-soaked raisins, toffee, caramel, and some oak. One word comes to mind to described this beer: Smooth. This style naturally comes with a strong malt presence and it is here, but the bourbon barrel has mellowed it out tremendously and has enhanced all the positives while hiding the negatives. The bourbon is here, but it isn't as forward as the standard BCBS, but it is still strong enough. The toffee and caramel from the aroma have returned on the taste to add a sugary component to the malt and bourbon cocktail. There's also a small breadiness that I associate with English ales. After the sweeter flavors there are some nice dark fruits like raisins and plums which work well with the subtle bourbon and sugary notes. This feels like a full-bodied barleywine which even has moments of mouth-coating goodness. It's not thick and syrupy, and like the flavor, it's smooth from front-to-back. As for the 12.9%, I don't know where the alcohol is hiding, but I can't seem to find it. The longer you drink this, each sip produces a warming sensation on each swig, but it's easily tolerable. Bourbon County Barleywine stands out from other barrel-aged barleywines thanks to a better balance of malts, sugary sweetness, and barrel character. The barrel aging didn't just add bourbon flavor, but it enhanced the base beer's characteristics tenfold. Truly at the head of its class.